The Flat Earth Myth remains a compelling story despite continued efforts by historians to debunk it (I’ve discussed it before). Typically, it combines two fables: first, people in the middle ages believed that the earth was flat; second, Columbus proved that the earth was round. Washington Irving’s popular biography of Columbus, A History of the Life and Voyages of Christopher Columbus (1828) made the Columbus part of the story fashionable, while Andrew Dickson White’s History of the Warfare of Science with Theology in Christendom (1896) cemented in our collective consciousness the part about medieval people. What would keep the earth steady and fixed at the center? Why, if the fixed stars are all equa-distant from the earth, as they must be if the earth is at the center of the vault of the fixed stars, do the stars appear different sizes, and vary in brightness color? Why do some stars seem brighter and therefore closer than some planets (he uses the example of Mars)? Why do the planets progress through the zodiac at some times and move backwards at other times? How can epicycles be real if the heavens are made up a perfect fifth element eternally in circular motion? His empirical and philosophical objections are not particularly persuasive. But what makes Cosmas’s argument especially suspect to modern eyes is his unabashed reliance on scripture. He did not disguise the fact that his goal was to use scripture to refute the fictions and fables of Greeks, by which he means pagan Greek philosophers. Cosmas did not help his cause or the reputation of Byzantine scholars in general, at least in our eyes, when he argued that the earth was shaped like a parallelogram, surrounded on all four sides by oceans. Cosmas’s model of the earth, taken from the 19th-c. edition printed by the Hakluyt Society. 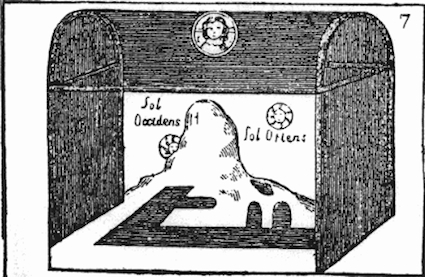 Cosmas placed this parallelogram inside a tabernacle, which reflected the shape of the cosmos. According to Cosmas’ reading, Moses was divinely inspired to construct the tabernacle because it mirrored the shape of the cosmos. Cosmas’s tabernacle-shaped cosmos, taken from the 19-c. edition printed by the Hakluyt Society. Cosmas became the poster child for the deluded premodern world filled with people who believed the earth was flat. Andrew Dickson White surveyed Cosmas’ ideas and ridiculed him for being deluded. Nothing can be more touching in its simplicity than Cosmas’s summing up of his great argument, He declares, “We say therefore with Isaiah that the heaven embracing the universe is a vault, with Job that it is joined to the earth, and with Moses that the length of the earth is greater than its breadth.” The treatise closes with rapturous assertions that not only Moses and the prophets, but also angels and apostles, agree to the truth of his doctrine, and that at the last day God will condemn all who do not accept it. Cosmas was not particularly influential in Byzantium, but he is important for us because he has been commonly used to buttress the claim that all (or most) medieval people believed they lived on a flat earth. This claim…is totally false. Cosmas is, in fact, the only medieval European known to have defended a flat earth cosmology, whereas it is safe to assume that all educated Western Europeans (and almost one hundred percent of educated Byzantines), as well as sailors and travelers, believed in the earth’s sphericity. Unfortunately, the Flat Earth Myth and Columbus’s role in it remain alluring and incredibly common. No amount of historical scholarship by itself will dislodge them from our popular consciousness. We must first understand why we hold onto these myths, why they make us feel so comfortable, what work they do for us. Only then we will have a better idea of how to replace them.